Yesterday, Thanksgiving in the US, the Hayastan All-Armenia Fund during its 12th annual telethon raised $15.8 million from viewers. Nearly $5.3 million of that total was donated by a Russian Armenian alone. It was a sharp 55 percent decrease from last year–$35 million was raised in 2008. On Wednesday night, the European Telethon raised $1.8 million. I was guessing around the time the protocols were about to be signed that Armenians in the diaspora would be less likely to donate money this year. Armenian diasporan communities were by and large opposed to the protocols. It makes perfect sense that donations would be paltry compared with previous years, last year especially. The 12th annual Hayastan All-Armenia Fund Telethon, dedicated to the rebuilding of Shushi, wrapped up at 8 am local Armenian time this morning. Raising a total of 15,875,043 in donations and pledges, this figure amounts to less than half the $35 million contributed last year. Speculation that the signing of the Armenia-Turkey protocols this fall by RoA President Serzh Sargsyan would turn off many in the diaspora from contributing this year seemed to be a major concern for Telethon organizers and their fears that politics might put a damper on this year’s fundraiser seem to have been borne out, at least in part. During the 12 hour broadcast, it was often stressed that one’s political views should not prevent anyone from contributing to the welfare of the people in Artsakh and the border regions of Armenia. Perhaps too, the global economic crisis had something to do with the significant drop-off in contributions. I am not discouning the money collected, naturally it’s a fantastic amount. The funds will supposedly go towards investment in Shushi, one of the important historic Armenian centers in Nagorno-Karabagh. However it seems a little late –Armenians have been waiting around for too long to invest there. I’ve never found any logic in putting off reconstruction and encouraging settlements as well as an economic boost by developing industry, and putting people to work. The local mafias have also ignored Shushi for some reason–maybe it’s for the better. Granted, with monies collected by the Fund the major highways in the independent republic were constructed, something that had to be done. The main roads outside of the capital, Stapanakert, were atrocious or even non-existent eight years ago when I first visited there. But during my last visit to Shushi in 2006, the road leading out of the city towards Stepanakert was still in disrepair (although a year earlier the main street in the center of town was recently repaved with new curbstones laid). I don’t know what has changed since then–I am assuming nothing. Only 5,000 people were estimated to be left in Shushi a few years ago. It would be a safe bet to believe that the number of residents has dwindled even more since then. There is nothing there but bombed out buildings and a lack of opportunities. People who are not store owners travel to Stepanakert to work every day. As I see it, the only way for people to remain in Shushi is though job creation. After you put people to work and even encourage people who left to move back, the community will rebuild, with the construction of new schools, hospitals and the like. No employment, no money being reinvested, it’s a simple rule of economics. The question is–when and how will those jobs be created? 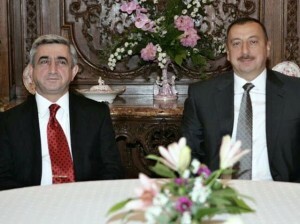 Sarkisian and Aliyev To Meet, But Why? Armenian president Serge Sarkisian is set to meet his Azeri counterpart Ilham Aliyev for the sixth time this year in Munich this weekend. Their last meeting a month ago in Moldova was considered a failure by Aliyev, and the Azeri side claimed that the Armenians were toughening their stance in finding a final resolution to the Nagorno-Karabagh conflict. Despite what may have been written in the press and vocalized by OSCE co-chairs in press conferences, little to no real progress has been made at all in the talks. So why are they meeting again before the end of the year? The Azeri foreign minister issues statements that are never encouraging about Armenia stalling, while Aliyev still has the audacity to announce that Karabagh will be won back by force sooner or later, even under criticism from the OSCE co-chairs for doing so. Recently information was revealed by the press suggesting that with this current peace proposal on the table, Nagorno-Karabagh would essentially return to the same status it had during the days of the Soviet Union. I find it hard to believe that the Armenian side has the intention to sign such a document after a few sticky points are resolved. I don’t know anyone who takes these negotiations seriously. These meetings don’t seem to spark any interest amongst the general public. Former president Levon Ter-Petrossian did address the issue during is tirades in front of the “Matenadaran” national archive building, but now that he is making nice-nice with the authorities by throwing his support for the Turkish-Armenian protocols, he’s not about to hold any more rallies. Thus public discussion about the peace process seems to be hovering like a helium-filled balloon. So what is there to talk about? What’s the point of this meeting? Does anyone really think that there will be a breakthrough this weekend? I just drove to Aparan, located in the Aragatsotn region nearly at the foot of Mount Aragats, to pay back taxes on land that I owe near there not far from a reservoir. My plot of land has an area of only 1,000 square meters, but naturally, like any citizen would (although I have a special residency visa and am thus not a citizen) I had to do my duty by paying taxes on what I owe to the Armenian government. Someone told me–I think it was the broker who arranged the sale of the land–that I had to go to the administrative building located in Aparan to make the payments. I arrived there with my wife only to discover that I indeed had to go to the village administration office instead. It wasn’t much of an inconvenience as the village is closer to Yerevan than Aparan is. We arrived there to find that the village mayor was out of the office, but an elderly woman informed the office secretary to come by and help us. The whole procedure took five minutes, and they were extremely kind. Although I hadn’t paid for three years, I am ashamed to admit, the amount due only came out to be a few thousand dram. Now at least I have some peace of mind knowing that I won’t be putting my land at risk of being repossessed. In practice, however, there isn’t such a thing as repossession it appears. I have never heard of any cases where someone lost their apartment because they were behind in tax payments for several years. Usually someone comes around once a year to collect taxes from home owners, and cases where the tax collector is turned away are not rare. Drivers need to pay taxes on their vehicles in order to keep the registration valid, that I know for sure. But most businesses seem to get away with evading taxes, so long as their owners do not feud with government officials. Then they start cracking down as was the case a few years ago when the co-owners of the Royal Armenia coffee import company were jailed for tax evasion, essentially in retaliation for speaking out against corruption in the custom’s department. They tried to do the same last year with influential businessman/oligarch Khachadur Sukiasyan, who sided with Levon Ter-Petrossian in the 2008 presidential elections. Sukiasyan went into hiding with a warrant for his arrest hanging over his head for allegedly having a role in the March 1 events, but just came out only a couple of months ago. He avoided prosecution, however, and apparently willingly agreed to resign from his parliamentary post. So long as you pay some kind of tribute to the authorities, you can basically avoid having to pay taxes on your earnings. Virtually all of these oligarchs and big businessmen are able to get away with it one way or another. Some even report losses to avoid paying them. It’s just small businessmen and ordinary citizens that are essentially required to pay. I believe that if the government actually enforced the mandatory payment of taxes by everyone doing business in Armenia, the problematic lack of funds plaguing the social security services would be resolved. Pensioners would able to receive decent monthly stipends–at least a few hundred dollars worth instead of the measly 20,000 dram many receive now, which amounts to a little over $50 with today’s exchange rate. The elderly deserve to live better, but the greedy oligarchs beg to differ it seems. Karineh Gevorgyan, like many others before her, was seduced by dreams of an “easy life” in Europe. Back in Armenia, they didn’t tell her about the realities that they’d face once they had arrived. Not knowing the language and having no substantive basis for traveling to France, I wondered how the two of them ever managed to obtain the necessary entry documents for these are quite difficult to come by. Not wishing to name names, Karineh, in all honesty, merely said that several people had intervened in the process that finally was successfully concluded. These were the people with the all important “stamps”. Once negotiations were conducted, the all important papers followed in quick succession. In the end, they had no trouble at all getting their visas from the Italian embassy. When this article appears they will have already spent all the money they brought with them and are preparing to go back to Armenia. But they too don’t have a house to come home to. Mr. Ghazaryan made a point of noting that when he gets back he’ll be settling some scores with the “document dealer” and that he’ll be demanding his money back. “I’ve been conned, and I’ve lost my house in the process,” he says. These people chose to leave Armenia. No one forced them to go at gunpoint or by blackmail. They had homes and most likely possess some sort of talent with which they could eke out a living in Armenia, although not prestigious perhaps. Despite whatever good intentions they have and naïve ones at that, they made the clear conscious decision to sell their homes and leave whatever possessions they had behind, to move to a country where they didn’t know the language and didn’t have any clue about what they were up against. The worst thing you can do is to move to a country where you have no contacts and no support base. These “victims” were simply foolish to believe that they would have everything handed to them on a silver platter by the French government once they had arrived there. The unidentified man who was able to secure visas for these and countless other families is simply a businessman, nothing more. He gave advice to people about how to play the system, and they didn’t follow it because they didn’t want to falsely identify themselves as Turks or Azeris. But what difference would that have made after having taken such risks, what were they trying to prove? It didn’t make sense, as were their illogical decisions to sell their homes, their only capital. I think that if you really want to work you can find a job in Armenia. It’s only refugees who are really down on their luck from what I have personally seen. Unless you are too proud to work as a laborer or a cleaner, there’s always something to do, no matter how much people complain about a lack of opportunities or whatever other nonsense. Basically if you are educated and have papers to prove that you are a citizen, you can manage, especially if you have a roof over your head that you own which most Armenians do, thanks to the Soviet experience. The work may not be glamorous or well paying (few jobs in Armenia are) but it would be a means of making a living. These people thought they were taking the easy way out, and they were downright foolish for believing so. I don’t consider them as being victims of a scam, and I can’t feel sorry for them. I’ve been silent lately because there aren’t really any exciting topics to discuss lately, whether in politics, culture or economics. Sure, there’s always cultural events happening—concerts, plays, ballets and so forth. But I can’t manage to attend them most of the time, so obviously there’s nothing to write about. Jazz guitarist and singer George Benson is coming soon, which is a first-time event in Armenia. Rock star Arthur Meschian is making a comeback tour after three years, and I’m definitely going to attend his concert to be held at the Opera House on November 15. The political situation at the moment is rather dull it seems. The ARF-Dashnaktsutiun in Armenia mentioned last week in a press conference that it would be seeking regime change, but without calling for President Serge Sarkisian’s resignation, which doesn’t make much sense to me—this holds true for the majority of the decisions the party has been making for several years now. The Armenian National Congress has changed its tune from being supportive of the rapprochement process between Armenia and Turkey to being highly critical of the deal, having recently rejected the protocols. Yet there are no anti-protocol rallies to speak of lately. Seems that politicians are waiting for something to happen, but what? One thing that I’ll bring up which I also talked about on my other blog is the new law prohibiting people of Yerevan to jaywalk–in other words, to cross the street anywhere they like to. Now they must go to crosswalks or use pedestrian bridges and underpasses, wherever they are available. It’s made driving a lot easier for sure, I no longer find myself having to steer around people standing in the middle of the street—or even between lanes of traffic. This was a huge problem and now it seems to have been curbed, although a few adamantly stubborn jaywalkers are still out and about. Unfortunately because of my office job I am not able to get out as often as I would like during the day, in search of something interesting to post about. However, I’m past due on tax payments on land that I own in the Aragatsotn region, not far from the town of Kuchak, and I’m anxious to get to Aparan so I won’t have to think about paying them anymore. I will be required to pay late fees for sure, but I can’t assume how much in advance. I’ll definitely post something about my experience here.